From Windows 7 to Windows 10 you can open the folder with the last saved search results! 1.) ... Foreword to the search results directory in Windows! 2.) ... Open the directory with the saved search settings! 3.) ... Move the folder with the search results! 1.) Foreword to the search results directory in Windows! If you regularly search for specific files in Windows, you can save the search criteria as a saved search to quickly access and run your searches without having to redo the entire search criteria. Windows stores your saved searches in your personal search folder. 2.) Open the directory with the saved search settings! If a search has never been saved, you'll need to create a new folder called "Search" if you want to move your personal search folder. See: ► Exporting and printing the search results Explorer (xls, csv, txt. Html)? Windows + R command %userprofile% and open Searches folder and the saved search results can be seen. (Image-1) Search results folder / directory on Windows! 3.) Move the folder with the search results! You can change this and choose where to put files in this search folder somewhere else on the hard disk, another drive, or another computer on the network. Practical if you want to do a clean reinstallation of Windows 10 and do not want to do without the saved searches. Open the %userprofile% folder and in the second file explorer the folder where it should be moved. Attention, it must be a move and not copy, otherwise the system registry entries are not changed correctly. PS: The quad-explorer may prove helpful here. OK, just right-click to select drag and drop and move. When copying the action, only one copy is created. See also: ►► Using the search field in the Windows file search! (Image-2) Move directory with the search results! See also: Windows 10 Disable search indexing (customize, enable) ! So now you know how to move the default location of your search folder to the desired location in Windows 10. As I said, this is not only true for Windows 10, so the screenshots are made under W10, but this is true for the following operating systems: Windows 10 (Redstone 4 & 5), 8.1, 8, 7: Pro, Home, Enterprise, Basic, Premium, Professional, Starter, Ultimate, Windows-Server 2016, 2012, 2008. 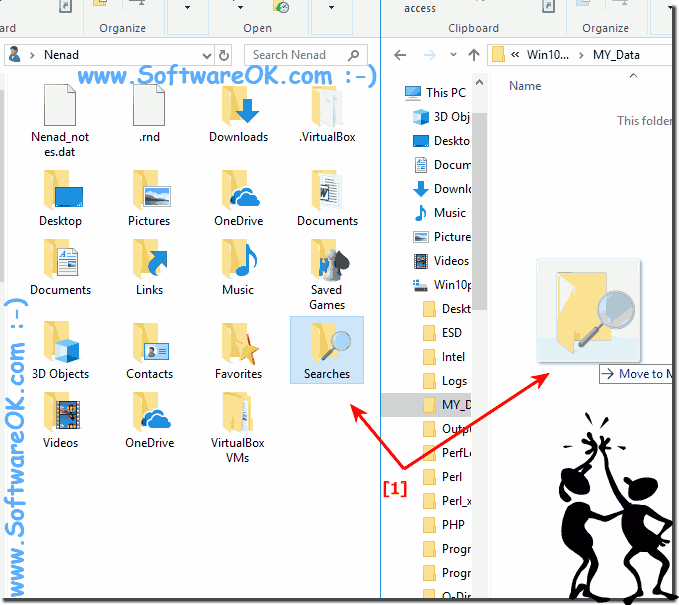 System-General - FAQ-23: Where is the search results folder / directory on Windows 10, 8.1, 7? Where is the difference to shut down and reboot Windows 10 (8.1, IE 11, 7)?